Recently I was interviewed by a member of the IBM internal communications team for their "meet a colleague" series. The interview, which was published on the IBM intranet went reasonably well, but there was one question that she asked me that I found difficult. She asked me "what do you blog about and why?". The reason why I didn't answer very clearly is because I don't really know this myself. It might seem surprising that I write a blog without a clear idea of why I am blogging or even a clear plan for what to write about it. However, to understand how this situation arose you need to know how I got started blogging. I initially started blogging on the IBM internal blog platform as part of an effort to understand the usefulness of the Lotus Connections product which at the time we were proposing to develop. My motivation was simply to get a better understanding of how/if people could derive value from using these tools because without this understanding I could not really judge if the platform we were developing was a good one or not. Towards the end of 2008, I had a discussion about my blogging activity with one of my mentors (who was an avid blogger). She advised me that blogging inside the IBM firewall was somewhat like cycling with stabilizer wheels - a useful training exercise, but nothing like the real thing. As a result of her advice, I established an external blog. Initially I wrote very few blog posts on my external but gradually I gained confidence and now I would say that I am reasonably comfortable with my blogging activity. I still have an IBM internal blog, but I post to that blog relatively rarely because I focus my efforts on maintaining the external blog. I still can't really say that I fully understand exactly how blogging can provide value for the blogger, but the fact that I am still actively blogging years later is evidence that I must be getting some value from all this effort. In general blogging can be used for spreading information and/or for facilitating discussion. As you will see below, I use my blog for both purposes (with mixed success). Why blog on IBM internal platform rather than external blog? : During the last year I wrote 103 posts to my external blog which means that I blog on average twice per week. However, I only posted 6 times on my internal blog . Three of the of the posts on the internal blog were cross-posts form the external one (to increase the chance of IBM employees seeing the post). Of the remaining three internal only posts, two were on a topic that would not be of any interest to someone outside IBM and one was expressing an opinion on an IBM policy. As I said earlier, I knew my external blog was taking over from the internals one, but I was surprised at this statistic. On reflection I should probably redress this balance slightly (even if this is only done by cross posting more frequently). What do I blog about? : In general I blog about whatever I am thinking about. When a though enters my mind about what would be a topic worth blogging about, I generally create a draft blog entry with that title to remind me. I revisit my blog when I have time available and work on polishing the draft entries until they are ready for publishing. At the moment there are 15 draft entries in my blog, but if I need more than a few weeks to polish them I take this as an indication that I don't have a very clear opinion on the topic to express and so I delete the draft. Do people read my blog? : My first ever first blog post got 7 views, as my blog became better known the number of readers settled into the low double figures. In the last year, none of my posts got fewer than 10 reads, roughly 2/3 of the posts received between 10 and 50 readers and the remainder were split evenly between posts that received 50-100 readers and posts that received over 100 readers. In general I am happy with this level of readership, after all I am not a celebrity and in reality there are ways people can read the content without appearing in the statistics so if anything the readership would be higher than these statistics indicate. Why do some posts receive a lot of readers? : This is a bit of a mystery for me because sometimes I write a post that I expect to be popular and it gets hardly any attention, but other times a post will be an unexpected hit. The most popular post over the last year (getting over 1,200 hits) was a description of how I recorded OSSBarCamp and converted the content into a format suitable for posting online so apparently this is a subject that people struggle with. Most blog posts are mainly only read in the week immediately after they are posted, but occasionally a popular post will continue to be read for a long time afterwards. For example, shortly after I started my blog I posted a test entry from my mobile phone. The entry did not have much content because it is difficult to type much on my phone and in any case I intended to delete it once I verified that it was successfully posted (but obviously I forgot). This turns out to be my second most popular post ever and interestingly almost all of the readers come from mobile devices (the content describes how I posted from my mobile and hence it is more interesting for this audience). Where are my readers? 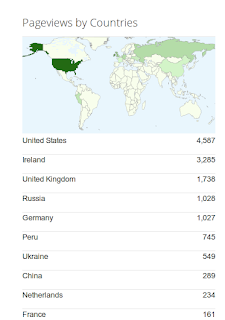 : Surprisingly, more of my readers come from USA (4,587) than Ireland (3,285) and my readers come from developed countries all over the world. 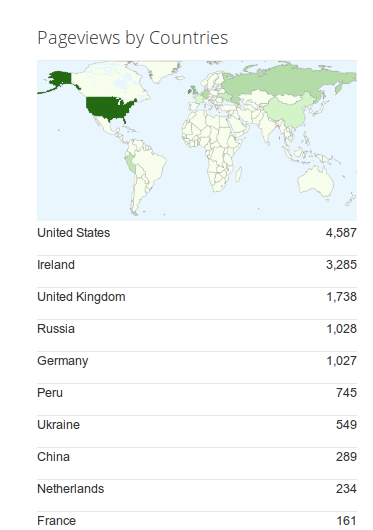 As you can see from this map, Africa and South America are not at all represented among the readers of my blog.. Does the blog help start discussion? : Unfortunately I get very few comments on my blog. Roughly 80% of my posts get no comments at all. Half of the remainder (10%) get 1 comment an only 10% receive more than one comment. At first glance this is very disappointing and would seem to indicate that the blog has very little success in generating conversation. However, I do find that I get quite a few comments that are not left on the blog itself. Sometimes people will comment on the Facebook of LinkedIn platforms where all of my entries get cross-posted. What really surprises me is how often I will be standing in the queue for coffee in work when the person next to me will turn around and say "I was reading what you wrote on your blog about X and I was thinking ..." - this can often lead to a very interesting discussion.